SW Revo is a Premium Multipurpose WooCommerce WordPress Theme that is created to fit any online shopping stores. Theme now is compatible with WC Vendor and Dokan plugin compatibility for the multi-vendor site. The theme is extremely customizable with multi homepage layouts, mobile-specific layouts, multi-headers and footers and lots of theme options that allow you to build and manage an online shopping website with ease. 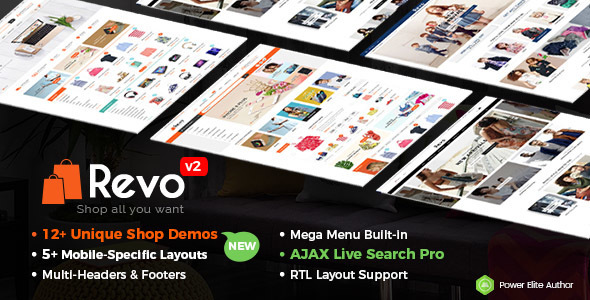 Revo WordPress theme is the combination of a powerful admin panel and the live drap-n-drop page builder (Visual Composer) as well as many cutting-edge features inside: RTL Layout, Powerful Mega Menu, Color Swatches, Product Quickview, 4 Product types, video product thumbnail and lots of premium widgets included. Furthermore, with One-click Demo Installation supported, you can quickly get a complete website look like the demo just by 1 click. Mobile Layout Supported: 5 Mobile Layouts, 3 Mobile Header & 2 Mobile Footer Styles, specially developed for mobile devices. SW WooCommerce Tab Slider: Display products on tabs of slider based on criteria: Lastest product, Best-selling product, featured product và top rating product. MailChimp: Colect mail list, manage and send email. SW WooCommerce Tab Categories Slider: Allow to show products of category in the Tab.